If English language elements are a collection of family members, the Subjunctive Mood is the sickly great-uncle, bed-ridden and lingering at death’s door for ages upon ages, and just when you think he’s finally kicked the bucket, BAM! He rears his hoary old head and demands a pudding cup. 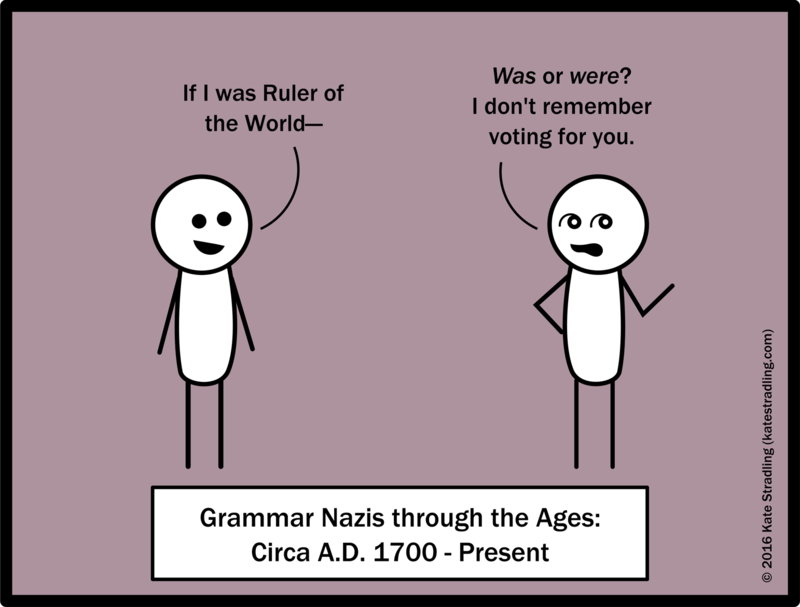 The “was” vs. “were” debate is by no means of recent origin. It started to emerge sometime in the 1600-1700s, but the transition began gradually enough that it’s still happening to this day. And the thing is, no one uses one or the other consistently. No one. Moods, in language, refer to the speaker’s disposition towards the words they’re saying. The Indicative (AKA the Declarative) is the default mood; there’s also the Imperative (which only has a 2nd person form because it’s demanding action from someone else), the Interrogative (for asking questions), the Conditional (for that non-committal speaker), and the good ol’ Subjunctive. The Subjunctive Mood expresses hypotheticals. Or, at least, it’s supposed to. But since it’s been dying out in English since the Dawn of the English Language (yes, really), it mostly gets trotted out when some pedant wants to put someone they don’t like in their place, grammatically speaking. Basically, in Modern English, the only place this mood could actually show up as different from the Indicative is in the 3rd person singular present expression (e.g., if he run, if she run, if it run). Unless we’re talking about a most irregular verb. That’s right. Proper use of the Subjunctive demands that you use “if I be” for present-tense hypotheticals. “If I be late to the restaurant, order without me,” said no one within the past three hundred years. Regardless of the cause, Subjunctive were has become marked as an oddity, yet it clings to its role with a death-grip. For every song lyric that starts “If I was,” there’s an armchair grammarian in the wings gnashing their teeth against the usage. But, again, only if they dislike the band. We’re very quick to condemn those we wish to find fault with and to excuse the ones we love. Whether the Subjunctive eventually dies its long-drawn death is anyone’s guess. At this point, it’s mostly personal preference that dictates whether someone uses it or not. And, frankly, calling someone out for their non-use is like criticizing them for not liking carrot cake: it’s pointless, fruitless, and—ultimately—counter-intuitive. It breeds hyper-correction and contempt, neither of which are good for cooperative communication. In my estimation, where Subjunctive were is concerned, it’s best to live and let live. Or die, as the case may be. The first option accompanies the Cinderella-type makeovers that occur near the end of the story, when the curtain drop is imminent and everything is twisting happily together. The second option, on the other hand, occurs when the makeover character has time to reflect on the many changes that their new look has prompted, and to assess whether those changes are pleasant or otherwise. I’m sort of a sucker for the second type. Much as I adore the whole before/after effects that a makeover brings into the plot, I love when a character realizes their inherent worth had nothing to do with their looks and that the grass isn’t always greener on the other side of the fence. Every set of circumstances brings its share of challenges, so when a post-makeover plot is all sparkles and sunshine, it feels unbalanced to me. Change is difficult, and whether a character can embrace it wholeheartedly or needs to step back a pace depends on their personality. The Makeover trope, as simple as it is, allows for variable results. It can also reveal when an author’s character development is lacking. Why is this character getting a makeover? What advantages will come from the makeover? What disadvantages? Does the makeover bring out the best in the character? Does it bring out a nasty streak? Post-makeover, does this character act true to their established personality? A higher social status—especially one achieved with relative ease—can bring out the worst in someone. Those who have been mistreated in the past often mimic that treatment upon others when they get into a position of greater influence. It’s human nature. Society is a fickle beast, and any easy ascent in popularity might just as easily vanish. The strong characters, then, are those who can recognize themselves beyond any pleasing or trendy façade, who treat others with dignity regardless of their position on Fortune’s ever-turning wheel, who learn from their mistakes and ultimately stay true to their fundamental beliefs. The Makeover itself might only be skin deep, but it lays bare the inward character—whether darling or demon. The Makeover Fairy (AKA the Fairy Godmother) exists in a story for the sole purpose of transforming the main character in a flash, and at a pivotal moment. The classic example for this trope is, of course, Cinderella, where the fairy godmother appears out of nowhere to cast a glamour over her ill-treated beneficiary. Much has already been said about the ham-handed convenience of such a fairy godmother, who allows Cinderella to live through years of abuse and injustice before she bothers to show up. I prefer to attribute her unreliability to the capricious nature of fairies in general. Why should she have come earlier? Was there ever a fab party on the line before? This breed of character marches to the beat of its own drum. Maybe it’s a fashion-forward co-worker, or the trendy-goth sister of the love interest. Maybe it’s Leonardo da Vinci. Regardless, the Makeover Fairy receives token acknowledgement within the story, but their only real purpose lies in helping the main character look ah-mazing. They swoop in—with or without the character’s consent—work their magic, and then gleefully send their human canvas out into the world. They don’t typically attend the Grand Event themselves. Their motives are altruistic, with no expectation of favors returned. If the story is a solar system and the main character is the sun, the Makeover Fairy is a comet, circling in for a dazzling close encounter before rocketing back out of the way again. The unsolicited makeover, too, lends to an air of humility for the main character. She didn’t go looking for beauty so she’s not vain, you see. She’s pure-hearted, and the universe rewards her for it. She’s also beautiful to begin with. You notice that she doesn’t need any pounds shaved or teeth straightened. Her aesthetic shortcomings amount to a few cosmetic tweaks. In the rare instance where this is not the case, the character’s transformation can be summed into a quick montage of morning jogs and salads for lunch, as though a complete lifestyle change only requires the decision itself and a peppy playlist. If only real life were that easy. But we don’t turn to fiction for real life. We turn for an escape, and one of the most seductive messages of escapism is that some exterior source is going to intervene and grant all of our fondest dreams, with little to no effort on our part. It’s a lie, but seduction typically is. The true pattern of hard work appears quite dull in comparison. Fictional makeovers almost always work. Unless the story invokes an Emperor’s New Clothes type of comeuppance, a character’s efforts to look their best will typically earn them some immediate reward according to their desires. Take a couple seconds to guess which one I think provides the more interesting plot line. Go on. Guess. Jaws drop. Eyes bulge. A higher social standing gets served up on a silver platter. This type of makeover is all about the reveal, all about that wonderful moment where the downtrodden former dweeb unveils their new, stylish look. This reveal usually involves a montage of the character sauntering slo-mo down a school hall or a street somewhere, parading their new digs to all their peers in that triumphant glory-walk. If it occurs near the end, the character gets their love and their success and lives happily ever after. If it happens toward the beginning, the character will get their desired effect for a season, but will likely realize they’re not happy and possibly revert to their old self, at least to some degree (but still live happily ever after that way, natch). This type of makeover feeds upon the social narrative that image is everything, and that the prettier you are, the better your life will be. Characters who want revenge against former tormentors often employ a makeover as one of their tactics. Sometimes, this makeover is drastic enough that they can assume an entirely different identity, unrecognizable to those who once knew them. The revenge makeover renders a character physically equal or superior to their opponents. It opens doors. It creates opportunities. It masks intentions. It is, however, a means to an end and not the end itself. The quintessential example of the revenge makeover occurs in Alexander Dumas’ The Count of Monte Cristo. Wrongfully imprisoned Edmond Dantès returns to society some twenty years after his supposed death to masquerade as the wealthy Count. Money, time, and life’s experiences transform him so that his victims fail to recognize the poor sailor Dantès beneath his cultivated façade. Instead, with a massive fortune to back his movements, the Count masterfully manipulates and systematically destroys the men who ruined his life. And the reader relishes every minute of his journey. The revenge theme makes for wonderful dramatic tension, most particularly because of the toll it takes upon the vengeful character. This darker theme breeds anti-heroes and fosters sympathy for the former tormentors, who suffer under reversed fortunes. It is both ruthless and humanizing, a true storyteller’s delight. The revenge makeover cynically delves beneath the “image is everything” narrative. Image becomes both a weapon and a weakness, ripe for the vengeful character’s exploitation. It facilitates the plot, but it does not govern it. Revenge itself governs until that fateful moment—if and when—redemption topples it from its lofty perch. Ah, the insta-transformation: Nerd – Glasses = Hottie. Those of us afflicted with myopia take exception to this particular trope, rampant though it runs through fiction. I’m sorry that, in my quest to see the world in focus, I sometimes don such an offending and uglifying accessory. Despite the fact that glasses offer a wide range of looks and styles, somehow, fictional nerds always seem to wear the worst possible option. They have to appear unflattering to the extreme, you see, thereby making their transformation all that more dramatic. Because if a makeover character wears glasses, you can bet those glasses are the first item marked for the trash bin, ahead of any ugly clothes or excess body hair. They might not be the first item to go, but rest assured, they were toast from the moment this character set foot on scene. In their place comes a pair of sleek and attractive contact lenses. And you can pretty much spot writers who have never worn contact lenses in their lives based on how easily those lenses are procured. Because I’m a giver, I’m going to provide some standard requirements for those unfamiliar with the actual process. Contact lenses require a prescription, which means that they also require an eye exam from a certified professional. A previous prescription for eyeglasses does not suffice. Because the contact lens rests on the cornea, the exam determines what type of lens is appropriate or if the candidate is even eligible for contact lenses. Some people aren’t. You cannot borrow someone else’s contact lenses or commandeer their extra set and expect to see clearly. And you would never use a lens that’s already been in someone else’s eye. Never. The school nurse does not carry replacement contact lenses. Not only do lenses require a prescription, but they also include a range of variables: hard/soft, daily or extended wear, and astigmatism correction, to say nothing of the prescription itself. An inventory of lenses makes sense only in an eye doctor’s office. There is a solid learning curve for putting in and removing lenses. You have to train yourself to touch your finger to your eyeball without blinking or flinching. Hard contacts are super easy to remove (pull the corner of your eye tight and blink), but soft lenses require more training to pinch that flexible piece of plastic from off the surface of your eye. It takes practice. Even though a person has contact lenses, it doesn’t mean the glasses are gone entirely. Certain things are more difficult with contacts: windy days, sandstorms, staring at a computer screen. Dry eyes are the bane of contact wearers, and a set of glasses makes life easier on those days you just don’t want to walk around with a piece of plastic in your eye. Now, I’m not saying that every fictional story with a glasses-to-contacts makeover requires extensive details about how the character procured their new lenses, but a sure-fire way to lose all credibility is to ignore this process. IT DOESN’T WORK THAT WAY. What’s more, your glasses-wearing character would know as much, because contacts have probably gotten at least a passing mention at every single eye appointment over the course of their life. Logically, they’re not going to use a lens acquired in a shady or slipshod manner. So, if you must include this particular element in your makeover trope, be responsible. Make your character an appointment with an eye doctor. Unrequited love is a literary staple. When a pure-hearted character yearns for the object of their adoration, this can become a driving force for the plot. Sometimes, though, it’s a mismatch, and the audience can tell from the onset that it’ll never work out. A common motif, especially in teen literature and film, saddles a socially inferior main character with a crush on the most popular person in school. Rarely is that popular person nice to the MC. On the contrary, they can insult, snub, or embarrass those beneath them (or keep company with others who do this, and say nothing), and this behavior passes as—if not acceptable—excusable because they’re popular. The mismatched crush plays a heavy role in a string of 1980s films: Sixteen Candles (1984), Some Kind of Wonderful (1987), Can’t Buy Me Love (1987), Say Anything (1989), and so forth. The oddball couple appeals, apparently, to a wide cross-section of viewers. Maybe it fosters hope within our shriveled hearts that one day, we too can connect with someone who is by all measurable standards out of our league. And if the socially superior individual is kind, the pairing makes sense and becomes endearing. If they’re a jerk, though, the crush itself becomes questionable. See, when that’s the case, the Socially Awkward Boy isn’t actually in love with the Popular Girl. He’s in love with a figment of his imagination, the shadow that he expects her to be rather than the person that she really is. Characters who pin their worth on what others feel for them will ultimately end up miserable—if not in the course of the story, then in the unwritten years that extend beyond. True value comes from within, and it exists regardless of whether the popular girl three rows up in math class thinks you’re cute. Napoleon and Trisha: I’m not even sure that Napoleon recognizes Trisha’s popularity. They’re in the Happy Hands Club together, and she’s friends with Summer Wheatly, but it’s almost like he chooses her at random to ask to the dance. And when she ditches him there, he doesn’t seem to give her a second thought. No heartbreak. No pining. No thirst for revenge. So refreshing! Pedro and Summer: Predictably, Popular Girl Summer turns down Socially Awkward Pedro’s invitation to the dance. We can presume that she was already set to go with her preppy boyfriend Don, but she doesn’t have the courtesy to make excuses. She flat-out rejects the transfer student via Napoleon, who breaks the news in a less-than-gentle manner, only to discover that—plot twist!—Pedro doesn’t care because he also asked Shy Girl Deb. Props to the socially awkward playa! Kip and Lafawnduh: Socially Awkward Kip connects online with his soulmate, who is so far out of his league that they really should be playing different games. I will admit, Lafawnduh is probably my favorite character in this film: she’s kind-hearted, composed, confident, and she gets what she wants. Plus, she supplies the crucial quest item for Napoleon’s final battle. Kip is basically the luckiest nerd on the planet. The Mismatch, as we see, can have multiple outcomes. It invites entertainment, angst, drama, and soul-searching. When poorly executed, though, it can leave its audience cold. Here’s where the nerd character loses me every time: when they possess a huge quantity of specialized, expensive equipment in their bedroom or tree house or wherever. I mean, come on. You didn’t buy that intricate distilling apparatus at your local Walmart. I’m guessing there are parents out there that like to cultivate their children’s science-oriented interests, and I guess spending $200-$1000 on lab equipment isn’t all that different than spending money on piano lessons, soccer fees, ballet classes, and all the expensive equipment thereof. But my mother wouldn’t even let us have Play-Doh® because she didn’t want to find bits of it stuck in her carpet. Junior chemistry sets were never even on the negotiation table. The nerd-owned amateur laboratory serves as a cheap means to advance a plot. Do the main characters need to analyze fingerprints or inspect crime-scene samples? To the convenient laboratory! Need to test for presence of chemicals or create an antidote? To the convenient laboratory! Need to hack into an evil corporate mainframe? To the convenient laboratory, now with the latest in computer technology! We all want the convenient laboratory in our own home, but the cost of keeping one would be astronomical—to say nothing of all the space it would commandeer. The chances of finding an amateur lab in a middle-class suburban neighborhood—a lab that’s not churning out meth, I mean—is probably slim to none. Dexter’s Laboratory: Here we have the stereotypical middle-class lab ad absurdum. There’s no way this lab exists in any real space, but in a cartoon, it’s perfect. There’s also no way that the lab’s owner would have an Eastern-European accent when he’s clearly been raised in American suburbia, but that’s also perfect. Flavia de Luce’s chemistry lab: 1) She lives in an English manor house, so there’s plenty of room for hobby-dedicated spaces. 2) The lab is a relic left by an eccentric ancestor. Convenient to the plot and her character both? Yes. But it also fits nicely into the rest of her world instead of being some random element tossed in for the sake of convenience alone. The Batcave: Bruce Wayne is a billionaire. He can buy as many tech toys as he likes. The end. I’d like to add: there’s nothing wrong with a junior chemistry set in a crawl space. That could make for a fairly entertaining set-up, in fact. But, like all things “junior,” such kits have their limitations—limitations that will hamper even the most stalwart of nerds. For more intricate work spaces, money will always be the crucial factor. Time to fire up that meth lab, Nerdly. The real question, Nerdly, is even if you could wrestle a newborn kitten, why would you want to? And that about sums up the Common Man’s feelings on Algebra. So, confession: I haven’t taken a math class since the 10th grade, which was more than half my lifetime ago. That was the year I finished Trig/College math, and instead of moving on to Calculus my junior year, I decided to drop A-hour. It was a good choice, given that I was already sleep deprived (a condition that was officially diagnosed later that year), but it forced me to give up my “math nerd” card, which I’d been carrying since the 6th grade. I really liked math once upon a time. I still like the idea of it, and sometimes I have to sit down and work through some math problems just for the heck of it. But the truth is that even though I had all the outward appearances of a math nerd for that short span from 6th to 10th grade, I was never really immersed in math. It was just something I did for school, and when I finished the required 4 credits, I never considered going further with it. Instead, I built up my nerd-cred in music, and when that petered out, I switched to English. I’m a Nerd-of-All-Trades, if you will. Still, when I look at nerds in fiction, I instinctively want to align them with a love for all things mathematical. And I really can’t relate to them at all, even though I once was counted among their ranks. It’s sad, but true. If the nerd is a schlubby, pimple-faced mouth-breather, he has an enormous mountain to climb before he earns our respect. However, if he’s even remotely hawt, he’s immediately ship-able. Nerd characters have come into their own in recent years, with more and more adorkable types appearing instead of the inhaler-huffing social pariahs of yesteryear. TV shows like Malcolm in the Middle and Eureka have showcased the value (and hilarity) of being smart. Malcolm in particular plays up the “ostracized nerd” stereotype to its fullest and emphasizes that nerds really are like the rest of us after all. In the realms of fiction, the stereotypical nerd can be spotted from miles away: awkward, bookish, and almost always subpar in the physical department. They like to study. They spout random factoids and scientific explanations. They can be part of the group, but not really. Social narratives play a dangerous game when it comes to intelligence. We want to be smart, but not too smart. Innate genius is wonderful if it comes out of the blue, but it’s mock-worthy if a person decides to foster it above all other pursuits. “Normal” people can’t relate to “smart” people. The label, much revered and desired, can ostracize as easily as it endears. The smart person lives in a different sphere, you see, and any attempt on their part to relate to the plebeian masses gets dismissed and/or ridiculed. One of the most common tropes for establishing a character’s level of intelligence comes through dialogue: the smarter the character, the more $5 words they use. While this might seem intuitive at first glance, there’s much more to this pattern than meets the eye. The linguistic field of Pragmatics teaches that language creates “Speech Acts”: that is, everything we say or write is meant to effect change. Language is not simply communication. It is manipulation. What we say and how we say it influence how others perceive us. However, practical language use places a much higher value in being understood. On this scale, the smartest speaker would actually be the one who gets their point across unhindered by misunderstandings. In other words, a person who constantly has to explain or rephrase their speech isn’t really smart at all. They fail at communication. Pragmatics teaches of three different effects to every Speech Act: locutionary, illocutionary, and perlocutionary. Locutionary Effect: The speaker’s actual words. E.g., A wife turns to her husband in the theater and says, “It’s so cold in here.” She is literally making an observation of the temperature of her immediate surroundings. Illocutionary Effect: The speaker’s unspoken intent. In the above example, the wife remarks to her husband about the cold because she wants him to do something about it: put his arm around her, give her his coat, commiserate with her, etc. No one simply observes the temperature of a room. At the very least, they want validation. Perlocutionary Effect: The listener’s reaction. The speaker has little to no control over this element. The husband of our example might put his arm around his wife, or tuck his jacket around her, or shiver beside her. He might just as easily say, “I’m fine,” or “I guess you should have brought a sweater.” And, chances are, his wife will be miffed, because the perlocutionary and illocutionary effects do not match. Generally, as the speaker, we want the second and third effects to agree with one another. That is good communication. As the listener, though, it’s sometimes fun to flout the speaker’s expectations. For the record, I’m no enemy of elevated diction. (I mean, seriously, I just used the phrase “elevated diction.”) Certain situations require specialized vocabulary. Sometimes that $5 word is really the perfect descriptor. It all comes down to linguistic codes. Everyone speaks in codes, both general and restricted. We use and encounter general codes out in the world: the combination of vocabulary, accent, and manner of speaking that best communicates meaning to the greatest number of people. For example, the nightly news aims for a general code, scripted to spread information to the public. Restricted codes, as their name implies, occur in less popular settings and use a specialized vocabulary, accent, and/or manner of speaking. That silly voice you use with your brothers or sisters or children is a restricted code. Quoting film dialogue with friends is a restricted code. The jargon you speak with your work colleagues is a restricted code. We have, each of us, dozens upon dozens of restricted codes, and the canny speaker instinctively knows which of these to use in any given situation, as well as whether to switch to a general code for better communication. And “different” is always a double-edged sword.